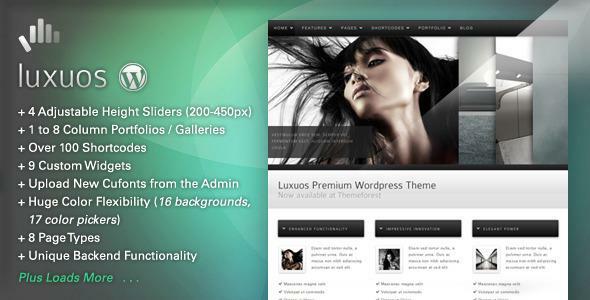 Luxuos is a powerful and flexible theme which is perfect for both users with no programming background and experts. It will enable you to set up your site quickly and easily, and you can tweak it to your specific requirements via the user friendly and powerful admin panel. The theme is built upon my new rock solid framework which provides some significant WP admin enhancements, excellent speed, loads of features and quality code. Create a stunning and professional website quickly and easily with Luxuos. Backgrounds: 16 color variations of the background swirls. 9 useful widgets are included. Support and styling for all standard WordPress widgets is also included, check this test page to see them all in action.